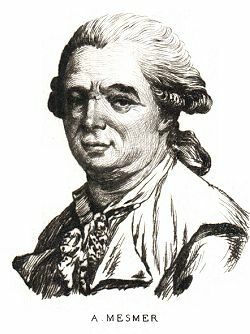 Franz Anton Mesmer (May 23, 1734 – March 5, 1815) discovered what he called magnétism animal (animal magnetism) and others often called mesmerism. Mesmer's ideas and practices would later be developed by James Braid as modern hypnosis. Mesmer's technique of healing was met with great enthusiasm by members of the public, but with extreme skepticism by members of the medical profession who considered him a charlatan. In Mesmer's time there was no room for "alternative" medicine in Europe—medical treatments had to be validated scientifically and have a logical explanation. Mesmer's "invisible fluid" and his esoteric techniques were no match for the doctors and academicians. Thus, his life was alternately one of success, fame, and fortune on the one hand, and exile and ruin—both financial and of his reputation—on the other. The later acceptance of hypnosis and psychoanalysis, as well as the study of psychosomatic disorders, has led to some understanding of the connection between mind and body with regard to health. Twentieth century interest in natural healing methods developed in the Orient such as acupuncture and reiki have furthered Western acceptance of the influence of the mind on the health of the body. Thus Mesmer can be regarded as a pioneer, far ahead of his time. 2.1 Animal magnetism and blind female "miracle"
Mesmer was born on May 23, 1734, in the Swabian village of Iznang auf der Höri, near the Bodensee in Germany. He was the third of nine children. His father was a forester employed by the archbishop of Konstanz; his mother was the daughter of a locksmith. After preliminary studies in a local monastic school in Konstanz, Mesmer began to study philosophy at the Jesuit university of Dillingen, Bavaria, changing in 1752 to theology. He continued his studies from 1753 at the University of Ingolstadt, where he soon abandoned theology. In 1759 Mesmer went to Vienna, first studying law, but then changed to medicine, receiving his medical doctorate on May 27, 1766. His dissertation, on the influence of the planets on the human body, Dissertatio physico-medica de planetarum influxu, was not considered revolutionary in medicine. On the contrary, it showed a common tendency to speculate about invisible fluids, derived both from Cartesianism and from the later queries in Newton’s Optics as well as from Newton’s remarks about the "most subtle spirit which pervades and lies hid in all gross bodies" in his Principia. A year later, Mesmer began to practice as a member of the faculty of medicine in Vienna in what was one of Europe’s most advanced medical centers. On January 16, 1768, he married a wealthy widow, Maria Anna von Posch. At the end of his celebrated and controversial practice that led him from Austria to France and Germany, Mesmer finally settled in Switzerland. He died in Meersburg, Germany on March 5, 1815. While a medical student at the University of Vienna, Mesmer had been impressed by the writings of the Renaissance mystic physician Paracelsus, and was fascinated by the idea of astrological influences on human health as the result of planetary forces. Maximilian Hell, a court astronomer and Jesuit priest, who used magnets in the treatment of disease, influenced Mesmer to conduct his first attempts at healing with a steel magnet. Mesmer applied magnets to his patients’ bodies and produced remarkable results, especially in the case of a young woman suffering from hysteria. He did not attribute his cures to any power in the magnets themselves; instead, he argued that the body was analogous to a magnet and contained a fluid that ebbed and flowed according to the laws of magnetic attraction. Mesmer developed this notion of an invisible fluid that responded to magnetic forces based on Richard Mead’s De imperio solis ac lunae in corpora humana et morbis inde oriundis (London, 1704). Mead had argued that gravity produced "tides" in the atmosphere as well as in water, and that the planets could therefore affect the fluidal balance of the human body. Mesmer adapted this, suggesting that magnetic forces could have the same effect. By the time he began to propound his theory of "animal magnetism," or "mesmerism," Mesmer had risen through the educational systems of Bavaria and Austria and had advanced to a position of some prominence in Viennese society through his marriage. Having moved from "animal gravitation" to "animal magnetism," he announced his new theory in Sendschreiben an einen auswärtigen Arzt (Mesmer 1775). Mesmer moved into a comfortable town house in Vienna, which he used as a clinic. His marriage brought him enough wealth to pursue his experiments at his leisure and enough leisure to indulge his passion for music. Mesmer knew Christoph Willibald Gluck, Franz Joseph Haydn, and Wolfgang Amadeus Mozart. The first production of a Mozart opera, the Bastien and Bastienne, took place in Mesmer’s garden, and Mozart later included a reference to mesmerism in a scene in Cosi fan tutte. Animal magnetism and blind female "miracle"
For ten years following his marriage, Mesmer experienced a time of prosperity and prominence. He built up his repertoire of techniques and cures; he gave lectures and demonstrations; and he traveled through Hungary, Switzerland, and Bavaria, where he was made a member of the Bavarian Academy of Sciences at Munich in 1775. Mesmer also developed a taste for publicity, announcing his cures in a manner that offended some of Vienna’s most influential doctors. In 1777 an 18-year-old blind female pianist, Maria-Theresa von Paradies, was brought to Mesmer. Her father was connected to the court of the empress dowager, Maria Theresa of Austria-Hungary, with whom the girl was a favorite. The girl had been blind since birth, but no physician had been able to find anything wrong with her eyes. Under the hands of Mesmer, mademoiselle Paradies gradually regained her sight. Her recovery occurred after treatment by Mesmer, despite the fact that she had been under the care of Europe's leading eye specialist for ten years without improvement. From the medical world of Vienna people flocked to witness this "miracle," and Mesmer enjoyed a period of interest in and respect for his innovative methods. Then the patient, who had received an artist's scholarship from the empress, lost her ability to play the piano during the therapy. Influenced by jealous doctors, the child's mother took her away from Mesmer's care before the cure was complete, and the hysterical blindness reasserted itself. Eventually accused of the practice of magic, Mesmer decided to leave Austria and his wife, who did not accompany him through the later episodes of his career. The next and most spectacular episode began with Mesmer’s arrival in Paris, France in February 1778. He set up a very lucrative clinic in the Place Vendôme and the nearby village of Créteil and then began an elaborate campaign to win recognition of his "discovery" from France’s leading scientific bodies. Helped by some influential converts and an ever-increasing throng of patients who testified that they had been cured of all manner of ailments, Mesmer seized the public’s imagination and alienated the faculty of medicine of the University of Paris, the Royal Society of Medicine, and the Academy of Sciences. His patrons, however, included Louis XVI of France and members of the royal court. The defenders of orthodox medicine took offense at what the public found most appealing about mesmerism—not its theory but its extravagant practices. Instead of bleeding their patients, mesmerists ran their fingers over their patient’s bodies, searching out "poles" through which they infused mesmeric fluid. In 1779 Mesmer wrote Mémoire sur la découverte du magnétisme animal, to which he appended his famous 27 Propositions. These propositions outlined his theory at that time. According to his close friend, d'Eslon, Mesmer understood health as the free flow of the process of life through thousands of channels in our bodies. Obstacles to this flow caused illness. Overcoming these obstacles and restoring flow produced crises, which restored health. When nature failed to do this spontaneously, contact with a conductor of animal magnetism was a necessary and sufficient remedy. Mesmer aimed to aid or provoke the efforts of nature. To cure an insane person, for example, involved causing a fit of madness. The advantage of magnetism involved accelerating such crises without danger. In the middle of the room is placed a vessel of about a foot and a half high which is called here a baquet. It is so large that twenty people can easily sit round it; near the edge of the lid which covers it, there are holes pierced corresponding to the number of persons who are to surround it; into these holes are introduced iron rods, bent at right angles outwards, and of different heights, so as to answer to the part of the body to which they are to be applied. Besides these rods, there is a rope which communicates between the baquet and one of the patients, and from him is carried to another, and so on the whole round. The most sensible effects are produced on the approach of Mesmer, who is said to convey the fluid by certain motions of his hands or eyes, without touching the person. I have talked with several who have witnessed these effects, who have convulsions occasioned and removed by a movement of the hand. Later, Mesmer "magnetized" a tree, so that patients could be healed by holding ropes hanging from its branches. The most noticeable effect of these devices was to induce a "crisis"—convulsions. He reasoned that his own body acted as an animal type of magnet, reinforcing the fluid in the bodies of his patients. Mesmerizing broke through the obstacle by producing a "crisis," and then restoring "harmony," a state in which the body responded to the salubrious flow of fluid through all of nature. Scores of Parisians fell into "crises" at the touch of Mesmer’s hand and recovered with a new sense of being at harmony with the world. Mesmer did not produce any proof of his theory or any rigorous description of experiments that could be repeated and verified by others. The mesmerists published hundreds of carefully documented and even notarized case histories, at least two hundred books and pamphlets. Thus mesmerism became a cause célébre, a movement that eventually eclipsed Mesmer himself. He limited his part in the polemics to two pamphlets, written by or for him: Mémoire sur la découverte du magnétisme animal (1779) and Précis historique des faits relatifs au magnétisme animal (1781). The first contained twenty-seven rather vague propositions, which is as close as Mesmer came to systematizing his ideas. He left the system-building to his disciples, notably Nicolas Bergasse, who produced many of the articles and letters issued in Mesmer’s name as well as his own mesmeric treatise, Considérations sue le magnetisme animal (1784). The disciples also formed a sort of masonic secret society, the Société de l’harmonie universelle, which developed affiliates in most of France’s major cities. At this society, Mesmer lectured and educated some three hundred students, who soon were active in 40 societies all over France. Mesmer again achieved a tremendous success with the public, and he became a rich man. The spread of this new treatment alarmed not only the old doctors but also the government. In 1784, on the initiative of king Louis XVI of France, a commission of the French Academy of Sciences was established to evaluate his practice. The commission was composed of distinguished doctors and academicians, including Jean-Sylvain Bailly, Antoine-Laurent Lavoisier, Joseph-Ignace Guillotine, and Benjamin Franklin. The report of the commission concluded that Mesmer's claims could not be backed by scientific evidence, and his fluid did not exist. They termed him a deceiver and ascribed Mesmer's "healings" to the fantasy of the individual, and physicians using his method were threatened with the loss of their practice. Another report, by the Royal Medical Society, presented the same conclusion. These reports badly damaged the movement, which later dissolved into schisms and heresies. It was ultimately the French Revolution that ruined Mesmer’s practice. During the revolution he lost his entire fortune and was forced to leave France, fleeing to England. In 1798 Mesmer returned to France in order to attempt to regain his fortune. In 1802 he moved to Versailles and made a settlement with the French government, which granted him a small pension. In 1803, however, Mesmer left France for good, first living in Meersburg am Bodensee, and then retiring to Frauenfeld in Thurgau, where he, forgotten, practiced medicine quietly. There he led a quiet and contented life, doing a little medicine, playing his glass harmonica, and remaining detached from the outside world. In the meantime, however, animal magnetism was being practiced as a therapy all over Germany. In 1812 Karl Christian Wolfart from Berlin visited the lonely Mesmer at the request of the Prussian government in order to be educated in his methods. Wolfart remained Mesmer’s staunchest supporter, and instigated the printing of Mesmer’s main work, Mesmerismus, oder System der Wechselwirkungen in Berlin in 1814. Although many of his learned contemporaries regarded Mesmer's practice as quackery, his theory of animal magnetism laid the foundations of modern hypnosis and suggestion therapy. The result obtained by Mesmer in his treatment of the blind pianist, seen in hindsight, was probably a result of the effect of hypnosis in psychotherapy. In 1814 Abbe Faria suggested that the phenomena described by Mesmer were not due to animal magnetism, but actually due to the power of suggestion. However, the popularity of Mesmer was so well established that Faria's hypothesis was soon forgotten. Although Mesmer’s own writings contained little in the way of scientific theorizing, they provided enough for his enemies to detect all manner of occultist influences and to align him with mystics and alchemists. But there is no proof that Mesmer was a charlatan. He seems to have believed sincerely in his theory, although he also showed a fierce determination to convert it into cash: he made a fortune from the Société de l’Harmonie Universelle, which, in return, claimed exclusive proprietorship of his deepest "secrets." Although physicians quickly abandoned Mesmer’s concept of a cosmic fluid, the idea of the mind playing a role in the health or illness of the body was not. Psychosomatic disorders became accepted as explanations for symptoms for which no underlying physiological cause can be found. Mesmerism is the direct ancestor of hypnosis, which in the nineteenth century, perfected by James Braid and Jean-Martin Charcot, became an accepted medical practice. Oriential medicine has long recognized that health depends on the balance of energy, known as Qi. Methods of restoring balance to this energy include Chinese acupuncture, in which needles are inserted and manipulated at key points in the body, and the Japanese Reiki method, which uses the hands to conduct the transfer of energy from the healer to patient to enhance the body's natural ability to heal itself through the balancing of energy. Other techniques include the use of magnets, either worn or passed over the body, as natural healing methods to restore the balance of energies in the body. In the twentieth century, advocates of alternatives to traditional Western medicine have adopted these methods. These techniques are so similar to Mesmer's "magnetic" therapy in terms of the physical sensations experienced by subjects that there are good grounds for concluding that all these phenomena are in fact the same, only differentiated by the name given to them in their specific context. The common "ideo-sensory" phenomenon of tingling, lightness, heat and cold, reported by subjects undergoing healing experiences, are the same as those routinely reported in hypnotic subjects. Similarly, the levitation of limbs or spontaneous movements in parts of the body also common in healing-systems are also routinely understood in hypnotherapy as ideo-motor phenomenon. Hypnotherapy has known mind-body effects, and can affect not only relatively superficial sensations or movements in the body, but can also lead to therapeutic changes via mind-body pathways. Mesmer, F.A. 1766. Dissertatio physico-medica de planetarum influxu in corpus humanum (Doctoral dissertation). Mesmer, F.A. 1766. Schreiben über die Magnetkur. Mesmer, F.A. 1775. "Zweites Schreiben an das Publikum." Wien Diarium, 6. Mesmer, F.A. 1775. Drittes Schreiben an die Frankfurter. Mesmer, F.A. 1775. Sendschreiben über die Magnetkur an einen auswärtigen Arzt. Vienna. Mesmer, F.A. 1779. Mesmer's 27 Propositions Propositions Concerning Animal Magnetism. Retrieved March 20, 2007. Mesmer, F.A. 1779. Mémoire sur la découverte du magnétisme animal. Geneva and Paris: Pamphlet. German translation, Karlsruhe. 1781. Mesmer, F.A. 1781. Précis historique des faits relatifs au magnétisme animal jusqu’en avril 1781. London: Pamphlet. German translation, Karlsruhe. 1783. Mesmer, F.A. 1785. Aphorismes de M. Mesmer. Mesmer, F.A. 1798. Sammlung der neuesten gedruckten und geschriebenen Nachrichten von Magnet-Curen vorzüglich der Mesmerischen. Leipzig. Mesmer, F.A. 1799. Mémoires de F. A. Mesmer sur ses découvertes. Mesmer, F.A. 1812. Über den Ursprung und die wahre Natur der Pocken, sowie über die Möglichkeit der gänzlichen Ausrottung durch die einzig richtige Verfahrensart bei der Geburt. Halle and Berlin. Mesmer, F.A. 1815. Allgemeine Erläuterungen über den Magnetismus und den Somnambulismus. Karlsruhe. Mesmer, F.A. 1814. Mesmerismus oder System der Wechselwirkungen, Theorie und Anwendung des thierischen Magnetismus als die allgemeine Heilkunde zur Erhaltung des Menschen. Anonymous. 1838. "Life and death of animal magnetism." Lancet: 834-836. Anonymous. 1848. "Mesmeric quackery." Lancet: 45-46. Bersot, Ernest. 1853. Mesmer et le magnétisme animal. Bergasse, Nicolas. 1790. Betrachtungen über den thierischen Magnetismum oder die Theorie der Welt und der organirsirten Wesen nach denen Grundsatzen des Hrn. Mesmer, nebst des Hrn. Marquis von Chatellux. Bramwell, Milne. 1921. Hypnotism: Its History, Practice and Theory. London: William Rider & Son Ltd.
Crabtree, A. 1988. Animal magnetism, early hypnosis, and psychical research, 1771-1925. White Plains, NY: Kraus International Publications. Kerner, A. J. C. 1856. Franz Anton Mesmer, der Entdecker des thierischen Magnetismus. Frankfurt am Main. Kiesewetter C. 1893. Frans Anton Mesmer’s Leben und Lehre. Leipzig. Mead, Richard. 1704. De imperio solis ac lunae in corpora humana et morbis inde oriundis. Scholz, W. Mesmer. 1902. Zukunft: 10, 34. Schürer-Waldheim. 1930. Anton Mesmer ein Naturforscher ersten Ranges, sein Leben und Wirken. Seine Lehre vom tierischen Magnetismus und ihr Schicksal. Sierke, Schwärmer. 1974. und Schwindler zu Ende des 18. Jahrhunderts. Tischner, R. 1928. Frans Anton Mesmer. Leben, Werk und Wirkungen. Tinterow, M. M. 1970. Foundations of Hypnosis from Mesmer to Freud. Charles C. Thomas. Wurm. 1857. Darstellung der mesmerischen Heilmethod. This page was last modified on 7 November 2011, at 15:06.